The groundbreaking alternative for the millions of couples with children who face divorce each year—couples who want to avoid litigation, but don’t want to give up on getting what they want. Even under the best circumstances, divorce can be marked by a range of painful emotions. But research now reveals that how a couple conducts themselves during a divorce has far greater impact on their children than the act of divorcing itself. 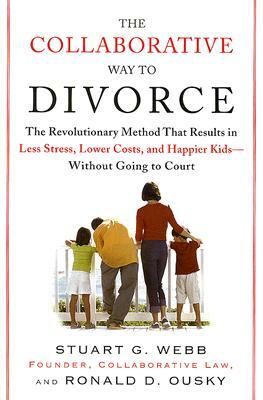 Groundbreaking and revolutionary, The Collaborative Way to Divorce is the first guide to the Collaborative process, a nationally acclaimed approach based on the concept that both spouses hire legal representation, yet agree to resolve their differences with no intention of ever going to court. Stressing cooperation over confrontation and resolution over revenge, Collaborative divorce is fast transforming how couples dissolve their marriages, divide their assets, and reinvent their post-divorce relationships, particularly when they have children. Written by Stu Webb, the founder of the Collaborative law movement and Ron Ousky, an early pioneer of the process, The Collaborative Way to Divorce guides you through the steps of the Collaborative process so that you can make better, more informed, and more strategic decisions—resulting in a win-win outcome for you and your spouse. Stuart Webb is a Minnesota attorney and a tenant of Collaborative Alliance, Inc. He created the concept of Collaborative Practice. Ronald Ousky is a pioneer of collaborative law and a board member of the International Association of Collaborative Professionals.